• Just 35 days after Mr. Cub, Ernie Banks, died, Mr. White Sox has also passed away. Legendary outfielder Minnie Minoso died early Sunday at the age of 90. The trailblazing Cuban, who suited up in major league games in five different decades, played parts of 17 seasons in the big leagues with the White Sox, Cleveland Indians, St. Louis Cardinals and Washington Senators. He hit over .300 in six different seasons and drove in more than 100 runs in four campaigns. In December, he was one of the finalists considered for induction by the National Baseball Hall of Fame’s Golden Era committee, but he fell four votes short. • The Toronto Blue Jays have signed outfielder Dayan Viciedo to a minor league contract. He will be paid $2.5 million if he makes the big league team. The club will have a look at him in the outfield and at both infield corner positions in spring training. The 25-year-old Cuban, who belted 21 homers but drew only 32 walks and struck out 122 times for the White Sox last season, is being dubbed the right-handed hitting version of Juan Francisco. And if you examine their numbers, that’s actually a pretty good comparison. Through 404 career games, the 28-year-old Francisco, who frustrated Jays fans with his high strikeout rate in 2014, has hit .236, posted a .297 on-base percentage and a .439 slugging percentage. Viciedo has competed in 483 contests and batted .254, registered a .298 on-base percentage and a .424 slugging percentage. • The Padres have also signed ex-Blue Jay Mike McCoy to a minor league deal. The stocky utility man, who last played in the big leagues with Toronto in 2012, will likely open the season in Triple-A. McCoy hit .181 in 88 contests with the Boston Red Sox Triple-A affiliate in Pawtucket in 2014. • Speaking of former Blue Jays, reliever Jeremy Accardo has inked a minor league deal with the Arizona Diamondbacks. The 33-year-old right-hander, who recorded 30 saves for the Blue Jays in 2007, last pitched in the big leagues with Oakland in 2012. He has split the past two seasons between the Washington Nationals’ Triple-A Syracuse Chiefs, the Mexican League and the independent Atlantic League. • Here’s something that I should’ve known before this week. 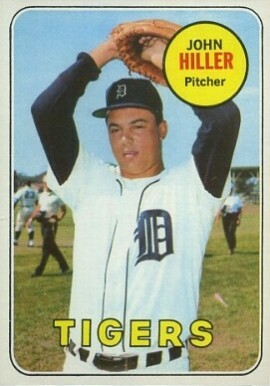 Toronto, Ont., native John Hiller owned the single-season, major league save record for 10 years from 1973 to 1983. After returning from a career-threatening heart attack, the Canadian lefty collected 38 saves in 1973 to eclipse the record set by Cincinnati Reds closer Clay Carroll the previous season. Hiller held the record until 1983 when Dan Quisenberry notched 45 saves for the Kansas City Royals. That record has since been broken several times and Francisco Rodriguez’s 62 saves in 2008 with the Los Angeles Angels is now the mark to be beat. • Former Colorado Rockies leadoff hitter Juan Pierre announced his retirement on Friday. The fleet-footed outfielder might have recorded the quietest 2,217 hits of the past 15 seasons. He also stole 614 bases, which ranks 18th all-time. Pierre was at his best at Montreal’s Olympic Stadium playing against the Expos. The 5-foot-10 speedster registered 37 hits in 97 at bats for a .381 batting average at the Big O. That was his highest batting average at any big league ballpark. • Jim King, who was named the International League’s MVP in 1960 while he was with the Toronto Maple Leafs, died on February 23 in Fayetteville, Ark., at the age of 82. King suited up for parts of three seasons with the Leafs, but he also belted 117 home runs in parts of 12 big league campaigns with the Cubs, Cardinals, Giants, Senators, White Sox and Indians. Following his career, King worked in the telecom industry. He’s survived by his wife, Rose, daughter Sheree, son David and two grandchildren. You can leave online condolences here. • This week’s trivia question: In 1973, Toronto native John Hiller recorded 38 saves to set the major league record for most saves in a season. Since then numerous pitchers have surpassed that mark and registered more than 38 saves in a season. Who are the two Canadian relievers who have recorded more than 38 saves in a season? Please provide your answer in the “Comments” section below. The first person to provide the correct answer will receive a 1981 Topps “Expos Future Stars” Tim Raines rookie card. Eric Gagne and John Axford? Yes, you are correct, David. Nice job! I will get the card out in the mail to you tomorrow. I have your address on file. Thanks for participating. Great stuff as always Kevin. Hiller was such a great pitcher. Imagine if he didn’t suffer the heart attack he might have been healthier for longer. Let’s hope Tyson goes back to his years a few years ago and plays much better. So much speed. Juan was so good. .290AVG and 600 SB. Wow…15 years of greatness. Thanks for the comment, Scott. I was surprised that Pierre had over 2,000 hits.